I no longer have any interest in fennel. After making a small soup with three bulbs (way too much! ), I can barely handle the smell without being nauseated. I am excited about the potatoes, though -- I think I'll save some of them and add them to my collection of various types of potatoes that I'll grow each year, for the sake of adding variety. Variety is good. I'm suffering from a bit of lettuce envy at the moment. The head of red lettuce that came in the box is quite large -- much larger than the same red lettuce that I've got growing in my garden. Perhaps the lack of good compost (which I've been making, but not yet applying to my garden) is probably the issue. I'll add some compost mulch to half my lettuce crop and see if it makes a noticeable difference. Everything else is going great. 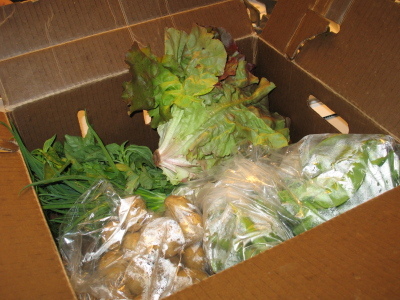 I have an option to continue the CSA program or quit, as I'm on a month-by-month payment plan. I think I'll keep going with it -- I like the added variety of food. Because I'm paying a particular premium on it, it is encouraging me to actually eat it, which is an odd way to handle nutrition, but it works for me. Luke - Generally speaking, I wouldn't think of buying this stuff from a grocery store either (well, except the potatoes). But I know that if I grew it, I'd eat it, because there's something delicious about it being my own. And being a part of a farming CSA feels like it's my own food... and so I've come to feel like I've grown it. It's weird. But it is kind of neat, really. Yum!